Thirty-eight Maryknollers are commemorating ordinations to the priesthood or Final Oath as Maryknoll Brothers in ceremonies held at the Maryknoll Mission Center in Ossining, New York, on Sunday, June 28, 2015. Brother Frank J. Norris, M.M. Brother Frank J. Norris, M.M., of Cincinnati, Ohio, celebrates his 65th anniversary of his First Oath as a Maryknoll Brother. Before entering religious life, Brother Frank served two years in the United States Army Air Corps. 1961-1975: Assigned to Tanzania, East Africa, to serve in the Shinyanga Diocese to oversee construction and maintenance work in the various missions of the diocese. 1978-1997: Assigned to Western Samoa as chancery administrator and technical director under Cardinal Pio Taofinu’u. Brother Frank was born on February 14, 1926 in Cincinnati. He attended St. Clare and St. Martin Parochial Schools and graduated from Elder High School. Father Francis Henry Beninati, M.M. 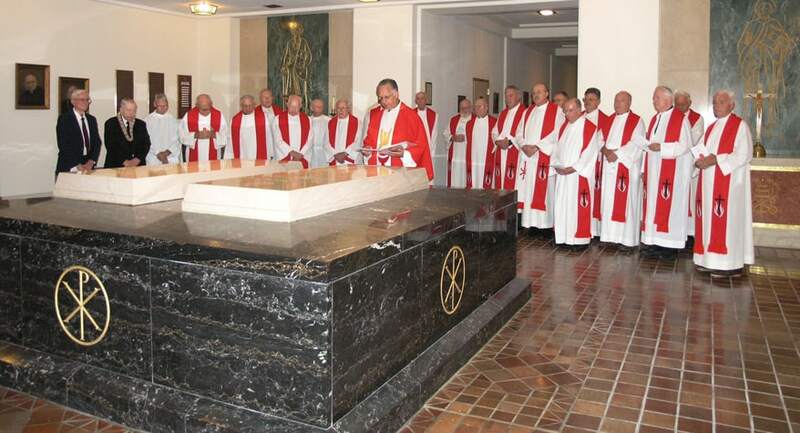 Father Francis Henry Beninati, M.M., of Farmington, Connecticut, celebrates his 60th anniversary of ordination as a Maryknoll priest. 1957-1980, 1986-1992: Assigned to Korea to work in Masan, Pusan and other large urban areas. He initiated a number of projects to care for refugees and the poor. These projects included housing, water supply systems, electrification, animal husbandry, night school for working children, schools for the poor, credit unions and a variety of small church communities. While pastor of inner-city parishes in the diocese of Pusan, Father Beninati also served as director of Hansen’s Disease Villages and Service from 1960 to 1992. He also was the director of the Vietnamese resettlement and refugee camp in Pusan from 1988 to 1992. 1992: Oversaw Maryknoll’s entrance into Vietnam, where he taught in Ho Chi Minh City. 1993-2000: Accepted an invitation to serve in the Korean Autonomous Province of China, an area formerly known as Manchuria, where he taught English, writing and conversation in Yanji City. He taught at Yanbian University, Yanbian Nursing College and Yanbian Vocational Training School. Father Henry Beninati was born on January 11, 1928, in Farmington, Connecticut, where he attended Noah Wallace Elementary School. He graduated from St. Thomas High School in Bloomfield, Connecticut, and he attended St. Thomas Seminary, also in Bloomfield, before entering Maryknoll. He earned a bachelor’s degree in philosophy and a master’s degree in religious education from the Maryknoll School of Theology in Maryknoll, New York. 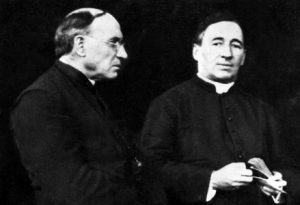 Father James P. Colligan, M.M. Father James P. Colligan, M.M., of Pittsburgh, Pennsylvania, celebrates his 60th anniversary of ordination as a Maryknoll priest. 1955-1966: Assigned to Japan with parish assignments in Sapporo and Kyoto Dioceses. Served four years as pastor and kindergarten principal in the coal mining town of Mikasa in Hokkaido. He also was an instructor in English literature at the Iwamizawa Division of Hokkaido University. During 1968, Father Colligan accepted a short-term assignment with the public information office of the Japan Bishops’ Conference and then obtained Japanese Government accreditation as a correspondent of the U.S. Bishops’ News Service in Washington, D.C. He served a year as Tokyo Bureau Chief for the Union of Catholic Asian News (UCAN) and then resumed his affiliation with the U.S. Bishops’ agency, now known as Catholic News Service (CNS). He was thrice elected chairman of Foreign Press in Japan (FPIJ), the organization representing foreign media interests. Father Colligan was born on October 2, 1928 in Pittsburgh. He attended St. Mary’s Grade School and graduated from Central Catholic High School. After two years at Duquesne University, Father Colligan entered Maryknoll. He earned a bachelor’s degree in philosophy from Maryknoll College. From the Maryknoll Seminary he earned an S.T.B. degree in sacred theology and a master’s degree in religious education. He also holds a master’s degree in journalism from Syracuse University’s Newhouse School. Father Daniel F. Ohmann, M.M. Father Daniel F. Ohmann, M.M., of Greenwald, Minnesota, celebrates his 60th anniversary of ordination as a Maryknoll priest. 1964-1996: Assigned to Tanzania, where he served as pastor of the Ndoleleji Catholic Church, a parish of 27 villages. Father Ohmann trained church leaders for these villages and was active in developing hospitals, clinics and agricultural projects. A highlight of Father Ohmann’s years at the village of Ndoleleji was the construction of windmills for the village drinking-water supply. Although Father Ohmann retired during 1996, he remains in Africa working with the Watatulu tribe in the Diocese of Shinyanga. Father Ohmann was born on July 6, 1927, in Greenwald, where he attended District 51 Grammar School. He graduated from Melrose Public High School in Melrose, Minnesota. In 1945, he entered the United States Army. Following his honorable discharge, he studied math and music at St. John’s University, Collegeville, Minnesota, before entering Maryknoll. Father Ohmann holds bachelor degrees in philosophy and sacred theology from the Maryknoll Seminary. Bishop John Quinn Weitzel, M.M. Bishop John Quinn Weitzel, M.M., of Chicago, Illinois, celebrates his 60th anniversary of ordination as a Maryknoll priest. 1979-2013: Assigned to Western Samoa, he served as pastor of Falealupo, one of the most remote parishes in that country. He was consecrated as the first bishop of Samoa-Pago Pago during 1986. Bishop Weitzel was born on May 10, 1928, in Chicago. He attended St. Francis Xavier grade school in LaGrange, Illinois, and St. Luke’s grade school in River Forest, Illinois. After graduating from Fenwick High School in Oak Park, Illinois, he entered Maryknoll. Bishop Weitzel earned a bachelor’s degree in philosophy and a master’s degree in religious education from the Maryknoll School of Theology. He holds a PMD in business administration from Harvard University, Cambridge, Massachusetts. Father Peter James Barry, M.M. Father Peter James Barry, M.M., of Troy, New York, celebrates his 50th anniversary of ordination as a Maryknoll priest. 1965-1969: Assigned to the Maryknoll Mission Region in Taiwan and appointed pastor of the Chingan Mission. He also served as pastor of Namchong Mission in the Hsin Chu Diocese. 1972-1979: Worked with students in St. Vincent Student Center in Shihlin, Taipei City. He was appointed third assistant to the Maryknoll regional superior in Taiwan. 1979-2013: Assigned to Hong Kong to work in Maryknoll’s China Liaison Program. This work entailed research on China and occasional trips into Mainland China. He also taught English at the Hunan College of Traditional Chinese Medicine in Changsha, China, and church history and English at seminaries in China. Currently, he works with the China Liaison Program and serves at the Holy Spirit Study Centre in Hong Kong. His missionary ministry includes working to build the local church by teaching in seminaries. He also serves as a manager for the Maryknoll Secondary School in Ngautaukok, Kowloon. Father Barry was born on February 13, 1939, in Troy, where he attended St. Mary’s Parochial School and graduated from LaSalle Institute. He earned a bachelor’s degree in philosophy from the Maryknoll Junior Seminary. At the Maryknoll Seminary, he received a Bachelor of Divinity and a master’s degree in religious education. Father Barry also holds a master’s degree in modern Chinese history from National Taiwan University, Taipei, Taiwan. Brother John J. Blazo, M.M., of Hempstead, New York, celebrates the 50th anniversary of his First Oath as a Maryknoll Brother. 1975-1982: Assigned to Nicaragua and Guatemala, traveling from village to village to train lay leaders and work in health and literacy projects. He also worked with adult leaders and local people in catechetical programs for sacramental preparation. With the help of the parish youth catechists and the local Boy Scouts troop, Brother Blazo instituted a small recreation center and library for the youth of the town of Poptun in the Petén area of Guatemala. A direct result of this work was the reopening of the town library. Brother Blazo was born in Rockville Centre, New York, on October 18, 1945. He attended Our Lady of Loretto Parochial School in Hempstead. After graduating from Archbishop Molloy High School in Queens, New York, he entered the Maryknoll Brothers Novitiate. He earned an associate’s degree in liberal arts from Westchester Community College, Valhalla, New York, a bachelor’s degree in adult education from Rogers College at Maryknoll and a certificate in educación pastoral y renovación personal from the Instituto De Religión en Cultura del Mexican American Cultural Center, San Antonio, Texas. Father Peter Lawrence Chabot, M.M. Father Peter Laurence Chabot, M.M., of Ontonagon, Michigan, celebrates his 50th anniversary of ordination as a Maryknoll priest. 1965-1988: He has served his entire overseas mission career in Bolivia. He served as assistant pastor in the Altiplano parish of Achacachi, 13,000 feet above sea level in the Andes Mountains. He also served in the Pando Vicariate, traveling up and down the Beni River to visit the people who lived in the jungle river communities. Father Chabot served two consecutive terms as Regional Superior of Maryknoll’s Bolivia Region. Father Chabot was born on August 9, 1932, in Ontonagon. He attended Ontonagon Grammar School and graduated from Ontonagon High School. Father Chabot attended the Michigan College of Mining before enlisting in the U.S. Marine Corps during 1951. He served as a sergeant until his 1954 honorable discharge. A year later, Father Chabot entered the Maryknoll Junior Seminary. He earned a bachelor’s degree in philosophy from Maryknoll College and a Bachelor of Divinity and a master’s degree in religious education from the Maryknoll Seminary. Father William J. Donnelly, M.M. Father William J. Donnelly, M.M., of Bloomington, Illinois, celebrates his 50th anniversary of ordination as a Maryknoll priest. Before entering religious life, Father Donnelly served in the United States Army. After completing a course in clinical psychology, he was assigned to work with clinical psychologists at a military prison in Neosho, Missouri. After his honorable discharge from the army, Father Donnelly worked as a commercial artist before entering Maryknoll during 1958. 1965-1990: Assigned to Guatemala and to a parish in Chiantla, Huehuetenango. During 1969, he was assigned to the Villa de Guadalupe in Guatemala City. He was named director of the Center for Integral Development for the Diocese of Huehuetenango and later served as pastor of the Cathedral Parish of the city of Huehuetenango. He then moved to Jacaltenango to serve as pastor of Santa Cruz Barillas in Huehuetenango. Hundreds of Father Donnelly’s parishioners from this area were killed during Guatemala’s civil war. 1998-2001: Appointed regional superior for Maryknoll’s Central America Region. 2001-2004: Served as assistant to Maryknoll’s regional superior of Latin America. He also served as coordinator in the Northern District, primarily responsible for Guatemala, El Salvador, Honduras and Nicaragua. 2013-Present: Assigned again to Guatemala and currently divides his time between the United States and Guatemala. During the summer, he performs mission education and promotion work in the U.S. Midwest and eight months of the year he serves in Petén, Guatemala. Father Donnelly was born on August 28, 1933, in Bloomington. After moving with his family to Peoria, Illinois, he attended St. Cecilia Elementary School and graduated from Peoria Central High School. He earned a bachelor’s degree in fine arts from Bradley University in Peoria. He also holds a bachelor’s degree in philosophy and a master’s degree in religious education from the Maryknoll School of Theology. Father Thomas Henehan, M.M., of Chicago, Illinois, celebrates his 50th anniversary of ordination as a Maryknoll priest. 1971-1975: Assigned to Guatemala, where he worked with youth and served as head track coach of the national team. He also started a youth center under the Archdiocese of Guatemala City. 1975-1996: Assigned to Chile, where he was appointed second consultor to Maryknoll’s regional superior. He initiated The Center for Pastoral Reflection in Santiago. Thousands of lay leaders have been formed and accompanied by professionals and experienced teachers who have staffed the programs at the center. During1988, he was appointed assistant regional superior for Maryknoll’s Chile Region. A year later, he was appointed regional superior for a three-year term, a post to which he was re-appointed during 1992. In 1994, Father Henehan’s position was changed to that of regional superior of Maryknoll’s new Andean Region, encompassing Chile and Peru. 2003-Present: A member of the Maryknoll Mission in Latin America (CMMAL) located in Cochabamba, Bolivia. He collaborates with the Maryknoll Hispanic Outreach in the U.S. (Discipulos Misioneros Maryknoll) in its effort to partner with various mission-oriented organizations working with the Hispanic community. One of the projects is a four-year mission formation program (2012-2016) in partnership with the Hispanic Pastoral Institute known as Fe y Vida. Father Henehan was born September 6, 1938, in Chicago. He attended Our Lady of Lourdes Parochial School in Chicago and graduated from Loyola Academy, Wilmette, Illinois. He earned a bachelor’s degree in history from Holy Cross College, Worcester, Massachusetts. He holds a Bachelor of Divinity degree from the Maryknoll Seminary and a master’s degree in Asian studies from Seton Hall University, South Orange, New Jersey. Father James L. Hilgeman, M.M. Father James L. Hilgeman, M.M., of St. Louis, Missouri, celebrates his 50th anniversary of ordination as a Maryknoll priest. 1965-1976: Assigned to Mexico, where he served as pastor among the Mayan people at Santa Cruz Parish, Carrillo Puerto, Quintana Roo, and then at San Sebastián Parish in Mérida and then in Col. Arenal in Mexico City. 1977-1988, 1993-2000: Volunteered for Maryknoll’s newly formed Mission Unit in Brazil. He served as unit coordinator for three years. During 2001, he was appointed assistant to the regional superior of Latin America and district coordinator of the Northern District. Father Hilgeman was born on June 5, 1938 in St. Louis, where he attended St. Mary Magdalen Parochial School. He then entered the Maryknoll Junior Seminary in St. Louis. Father Hilgeman holds a bachelor’s degree in philosophy from the Maryknoll College and a Master of Divinity degree from the Maryknoll Seminary. Father Thomas J. Marti, M.M. Father Thomas J. Marti, M.M., of Seattle, Washington, celebrates the 50th anniversary of his ordination as a Maryknoll priest. 1965-1975, 1983-1990: Assigned to the Philippines and served as assistant parish priest in St. Francis Xavier Parish in Sigaboy, Southeastern Mindanao, and at Christ the King Parish in Tagum, Davao del Norte. He was appointed the first Social Action Director of the Prelature, promoting literacy, family life education and the organization of farmers and teachers. He was instrumental in organizing the Mindanao-Sulu Secretariat of Social Action (MISSA), and he became its first executive secretary. Later, Father Hilgeman served as associate pastor in Malangas, Zamboanga del Sur, in Southwestern Mindanao. During 1985, the Association of Major Religious Superiors in the Philippines (AMRSP) requested that Father Marti create an international network of solidarity. He served as director of the International Solidarity Network Desk (ISND) of the AMRSP Justice and Peace Commission for five years. Father Marti was born on May 12, 1937 in Seattle, where he attended St. Edward’s Parochial School. After graduating from O’Dea High School, he entered the Maryknoll Junior Seminary in Los Altos, California. Father Marti earned a bachelor’s degree in philosophy from the Maryknoll College, and a bachelor of Divinity and a master’s degree in religious education from the Maryknoll Seminary. Father Donald P. McQuade, M.M. Father Donald P. McQuade, M.M., of Astoria, New York, celebrates his 50th anniversary of ordination as a Maryknoll priest. 1965-1968, 1971-2005 : Assigned to the Prelature of Tagum, Mindanao, the Philippines. Except for a brief assignment in Kalimantan, (Borneo) Indonesia, during 1977, his entire mission career has focused on the Philippines. His ministries have included clinical pastoral education, counseling alcoholics and drug addicts, retreat work, parish apostolate and writing. Father McQuade was born on February 6, 1931 in Astoria, where he attended St. Joseph’s Parish School. He graduated from Bishop Loughlin Memorial High School, Brooklyn, New York. After earning a bachelor’s degree in philosophy from Fordham University, Bronx, New York, Father McQuade joined the United States Army. He served as a first lieutenant in Japan and was honorably discharged on April 18, 1955. Father McQuade worked for a shipping company in New York and in Europe before entering Maryknoll during 1960. He holds a bachelor’s degree in theology and a master’s degree in religious education from the Maryknoll Seminary. Father Michael D. Bassano, M.M. Father Michael D. Bassano, M.M., of Binghamton, New York, celebrates the 40th anniversary of his ordination as a priest. Following ordination in the Diocese of Syracuse, New York, on May 16, 1975, Father Bassano served as associate pastor at St. Anthony of Padua Church in Utica, New York, St. Thomas Aquinas Church in Binghamton, New York, and St. John’s Church in Utica. Father Bassano then applied to the Maryknoll Associate Priest/Brother Program. He signed his first contract during 1987. 1987-1997: Assigned to Santiago, Chile, where he worked in the marginal areas of the city. Father Bassano’s interpretation of the Gospels occurred through song and theater in the plazas of the city. He also worked with the prisoners in Santiago. During 1992, Father Bassano extended his contract for an additional five years and continued his work and ministry in Chile. 1997-2008: Father Bassano applied for incardination into the Maryknoll Society and was accepted on October 27, 1997. After taking his first oath on January 27, 1998, Father Bassano was assigned to the Overseas Training Program in Bangkok, Thailand. He worked with HIV/AIDS patients and with orphaned and abused children in the slum of Khlong Tory in Bangkok. 2008-2013: Assigned to Tanzania. He ministered to people afflicted with HIV/AIDS and welcomed the mentally and physically challenged, the homeless and the abused to the House of Compassion in Musoma, Tanzania. 2013-Present: Assigned to Kenya and South Sudan. Father Bassano was born on December 22, 1948, in Binghamton, where he graduated from Seton Catholic Central High School. He holds a bachelor’s degree in philosophy from Wadhams Hall Seminary College, Ogdensburg, New York, and a Master of Divinity degree from St. Bernard’s Seminary, Rochester, New York. Father James H. Kroeger, M.M. Father James H. Kroeger, M.M., of Appleton, Wisconsin, celebrates his 40th anniversary of ordination as a Maryknoll priest. 1975-1982, 1985-Present: Assigned to the Philippines, where he was appointed director of the Maryknoll Institute of Language and Culture in Davao City, a post he filled on two occasions for a total of 10 years. He also served as assistant parish priest in St. James Parish, Cateel, Davao Oriental, and he was resident professor, library director and academic dean at the St. Francis Xavier Regional Major Seminary in Davao City. Father Kroeger taught in various capacities at the Davao Major Seminary, the Philippine Lay Mission Program, the Mother of Life Catechetical Institute and the Jesuit Loyola School of Theology in Manila. He was consultor on the Maryknoll Philippine Regional Council from 1986 to 1990. He was appointed full professor in the Pontifical Faculty of Theology at the Loyola School of Theology in Manila. He currently serves with the Office of Evangelization of the FABC (Federation of Asian Bishops’ Conferences), is executive secretary of AMSAL (Asian Missionary Societies of Apostolic Life) and serves as president of PACM (Philippine Association of Catholic Missiologists). Father Kroeger was born in Appleton on December 4, 1945. He attended St. Mary’s Elementary School in Greenville. Father Kroeger’s high school and junior college studies were at the Sacred Heart Seminary in Oneida, Wisconsin. He graduated from St. Paul Seminary, St. Paul, Minnesota, with a bachelor’s degree in philosophy and psychology, and he entered Maryknoll the same year. He holds master’s degrees in divinity and theology from the Maryknoll Seminary and licentiate and doctorate degrees in missiology from the Gregorian University in Rome, Italy. Father Timothy O. Kilkelly, M.M. Father Timothy O. Kilkelly, M.M., of Minneapolis, Minnesota, celebrates his 25th anniversary of ordination as a Maryknoll priest. 1990-1998, 2000-2002: Assigned to Hong Kong and served in pastoral ministry for five years at Saints Peter and Paul Church. He also served in prison ministry and as the chaplain for Catholic youth at the Chinese University of Hong Kong. 2009-2012: Assigned to Maryknoll’s China mission. Since 2013, he has served as project coordinator of the Maryknoll Chinese Seminary Teachers & Formators Project. The project recruits, arranges programs for academic study and accompanies students during their study period in the United States. Father Kilkelly was born on August 23, 1959, in Minneapolis. He attended Holy Family Grammar School in Minneapolis and graduated from Benilde St. Margaret’s High School in St. Louis Park, Minnesota. Father Kilkelly earned a bachelor’s degree in German and business from the College of St. Thomas, St. Paul, Minnesota. He received a Masters of Divinity degree from the Maryknoll School of Theology and a licentiate degree in spirituality from the Gregorian University in Rome, Italy.